Our old twenty dollar bill price guide is the best on the internet. We are specifically focused on $20 bills printed by The United States before 1928, back when paper money was about 35% larger than it is today. There was quite a diverse issuance that most people are not familiar with. 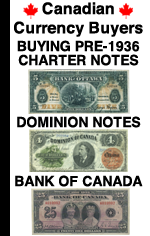 Demand notes, legal tenders, silver certificates, treasury notes, gold certificates, federal reserve notes, and national bank notes were all printed between 1861 and 1927. Our guide below shows the major design types of old twenty dollar bills. Some years used very similar styles, artwork, and portraits. So when trying to find your exact bill, we would suggest focusing more on the style and less on the year. That will help you find what you have instead of getting caught up on not seeing the exact year. The picture guide has value information as well. Looking at all the pictures, I think it is easy to see why collecting $20 bills is fun. It is also challenging. 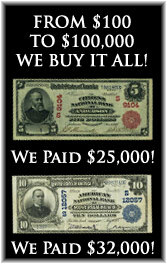 Twenty dollars represented a very large sum of money in the late 19th and early 20th centuries. Furthermore, the quantities of twenty dollar bills printed is usually a fraction of other smaller denominations. Those two factors make some of these bills very difficult to locate. If you have the time and checkbook, then there really are a lot of fun ways to collect old twenty dollar bills. A lot of people like a set by year. Other collectors focus on the major design types shown above. People who are really into history often focus on portrait collecting. Today we associate Andrew Jackson with a $20 bill. However, before 1928 there were nine different men on the twenty dollar bill. You can learn more about who is on the $20 bill. It is an interesting read and answers a lot of questions about who is on what. What Is The Rarest $20 Bill Printed? There are lots of rare twenty dollar bills printed during the 1860s. The most iconic and most valuable of which is probably the 1863 $20 gold certificate. Very few are known to exist and when they come to market they usually demand over $100,000. There are lots of unique or semi-unique notes once you factor in star and mules. However, when it comes to design types then the 1863 gold certificate and the 1861 demand notes are the rarest. What Are The Most Common Large Size Twenty Dollar Bills? 1914 $20 blue seal federal reserve notes are very common. Most of them are worth around $60. 1922 $20 gold certificates are the second most common (as are most 1906 $20 gold certificates). Many legal tender notes from the series of 1880 are also common. However, there is an exception for every rule. We would still encourage you to ask us about your specific note even if you think it is common. What Is The Most Valuable $20 Bill? I will amend this to read, what is the most valuable $20 bill that you are likely to find. The answer to that is the 1905 $20 gold certificate. It is a one year issue and it is very popular collectors call it The Technicolor note. The front is especially colorful. It is barely 100 years old. Some examples can be bought for less than $2,000. However, most examples are worth low five figures. What Is My Favorite Old Twenty Dollar Bill? That is an easy one. Since I share part of my name with Daniel Manning, I have to say that I like 1886 and 1891 $20 silver certificates the best. It is also a very fun series to collect. There are many seal types, serial numbers, different backs, and even stars notes. Prices range from hundred to thousands of dollars. What Is The Best Way To Get An Appraisal? In order to get any kind of accurate appraisal on your twenty dollar bill you will need to have scans or digital photos of the note. We actually prefer digital photos against a white background. That usually makes the note easiest to grade. 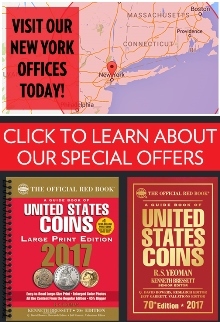 Ask a couple of different people who specialize in currency for their free opinion. If you have a huge collection you might have to pay, but most people are willing to give a free appraisal for a handful of items. Is Now A Good Time To Invest In $20 Bills? 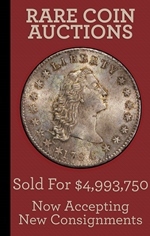 I never recommend buying any collectible money as an investment. There are certainly safer plays like a mutual fun or CD. However, most old twenty dollar bills are traditionally undervalued compared to other denominations. So I don’t think any paper money is an investment, but if you had to pick something to focus on, $20 notes do have a great chance to appreciate.